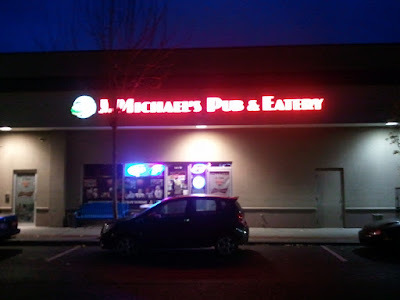 J. Michael's Pub & Eatery in Redmond, WA. I had had the dip at J. Michael's a couple of times before and knew that I needed to review it for the blog; I was getting down to the nitty gritty of dips left to review on the east side, so it was off to J. Michael's after work on a Monday. 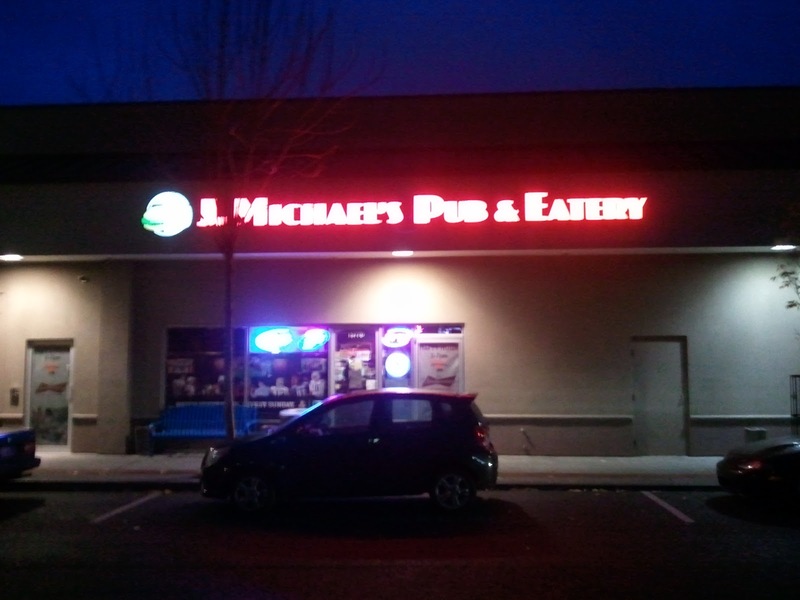 J. Michael's is a sports bar in Redmond that primarily serves to the blue collar working class. They have a pretty simple menu, lots of TVs, pool, video games, pull tabs and a very relaxed, easy going feel. Diners order at the bar from a board with the menu items posted. The dip is $7.00 and fries are $1.50. I added a salad and got a Coors Light. The French dip. You can see that it's quite large. The au jus looks funny in this picture bat it was fine. The dip is quite large; lots of bread. 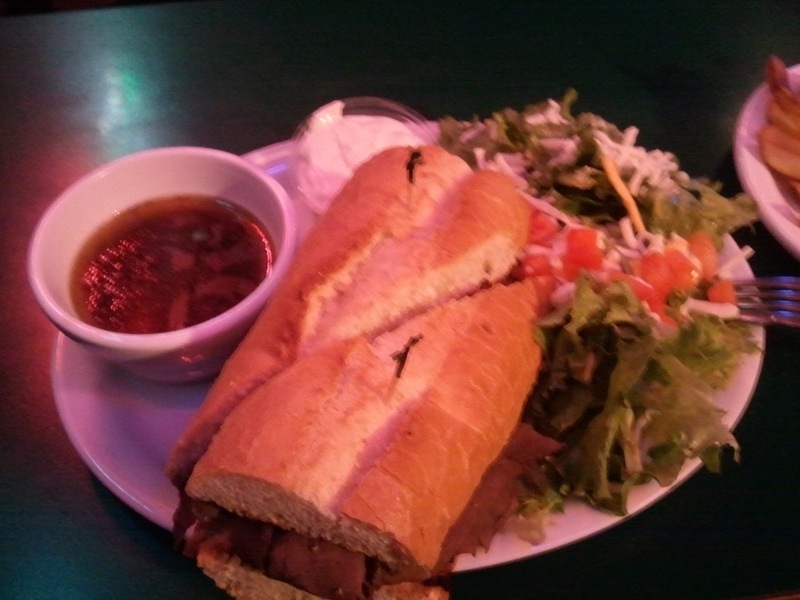 As you can see in the picture the au jus is not enough for the sandwich's extreme amount of absorbent bread. The salad that it came with was quite plain: just cheese and a few tomatoes. They provide a LOT of bread. It was fine, classic sandwich roll French bread. The bread had a slightly burnt grilled flavor. Enough very salty, fine-tasting roast beef. Quite a bit of rather salty roast beef on some very thick, bulky bread. The au jus was hot and salty and fine. I had to order three bowls to make it through all of the bread!!! 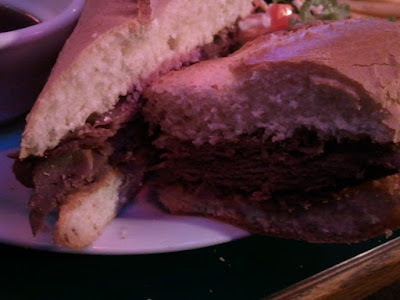 This was a classic French dip that was pretty large. It was very salty and "good" but just a lot of it and at some point the sodium quantity kind of bothered me. Since I'd had so many fancy Prime Rib dips lately, this kind of dip paled in comparison for me, although it was a totally valid, fine Classic. 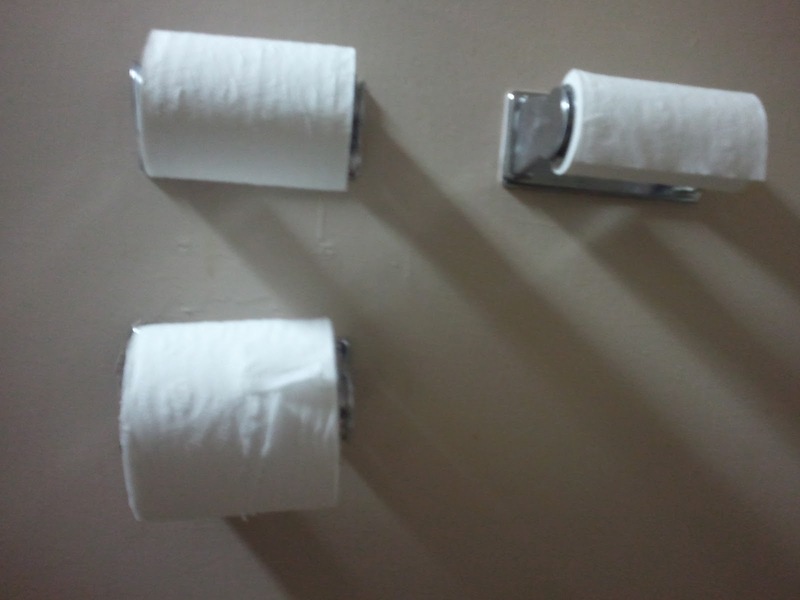 They appear to have a penchant for many toilet paper rolls. Take your pick!!! Redundancy is the name of the game in this mens room at J. Michael's!! 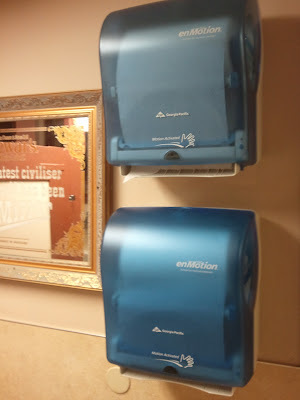 The bathoom at J. Michael's made me laugh. It was kind of dirty and had some silly oddities. Lots of very absorbent French bread, which ultimately required 2+ au juses to knock it down! Quite a bit of very salty roast beef. A pretty big and very salty classic French dip. Reason to go back: beer, pool, video games, and very basic, standard bar food. None of that fancy gourmet crap!